You have a chance to buy this pair of ladies wedding shoes by Next. Marks &Spencer Autograph used ladies shoes size 6 5. Condition is Used. Dispatched with Royal Mail 2nd Class. Ted Baker womens shoes size 7. Cream with bow detail. These are new and never worn however there are some marks as shown in the photos. Would be great with a summer dress or a wedding dress. Check out my other shoes for sale. Ladies Silver/Light Grey Crystal NEXT Court Shoe Size 39/6 BNIB . Condition is New with box. Satin Material/Crystal jewel front Dispatched with Royal Mail 2nd Class. Track & Trace signed for. A classic court shoe, with a pointed front. stain resistant technology. Colour – Black. Charcoal grey satin with sequin detail and peep toe. H a v e a l o o k a t m y other i t e m s - h a v i n g a clear-out. THIS IS A PAIR oF STEPHAN PEEP TOE COURT SHOES COVERED IN RHINESTONES IVORYCOURT SHOES SIZE 8/41. Jasper Conran Satin Court Shoes With Diamante Trims Size 4. Dispatched with Royal Mail 2nd Class. Worn once Ted Baker Black Satin Bow Azeline Shoe Heels UK Size 5/euro 38. Condition is Used. Dispatched with Royal Mail 2nd Class. In original box. Ladies Ted Baker satin material court shoe heels UK Size 5 - approx 4.5 inche heel Black in colour with metallic gold heel and sole Lovely gold metal stud logo/detailing to rear of heel Some wear to soles of shoes but otherwise in a good condition NB previously worn with Ted Baker skater dress, also for sale UK delivery only, to be posted by Royal Mail Recorded Delivery. Shipping will be made as soon as possible after payment received. I am a genuine, honest eBay seller. Any questions, please feel free to ask. Check out my other items for sale! PayPal payment only. Returns not accepted. Ladies Shoes - Black - Size 8 - Open Toe Sling Back Satin Feel-flashy stones. 3 inch heel. Condition is Used. Dispatched with Royal Mail 2nd Class. 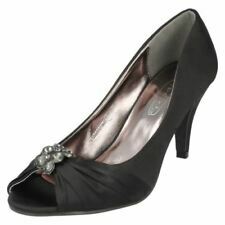 New Look Black Satin Flower Detail Wide Fit Court Shoes, Size 4, standard E fit, 3" heel, worn once. Lunar Elegance Womens Shoes Size 6 39 Satin Grey Peep Toe. Dispatched with Royal Mail 2nd Class. Guess Black Satin Stiletto Court Shoes UK 2 / US 5M. Slim fit / would not be suitable for wide feet. Condition is Used - satin has come away from the heel on one of the shoes but can easily be glued back in place - pictured. No refunds or returns. Dispatched with Royal Mail 2nd Class. A smart pair of black peep toe mid heel shoes. Satin feel fabric with a synthetic sole. Stiletto style heel with an open side. Pleated stripe detail to the toes and a cut out. New Look Ladies Cerise Pink Satin Court Shoes. Size 6. Condition is Used without box. These quality cerise pink satin court shoes have a hidden platform to give height with comfort and have a delicate single bow finish to the front. The heels of the shoes measures 4ins but feel more like 3ins. There are no scuffs or damage to the heels. These shoes have been worn once for a wedding but are in good condition. I will be listing a matching fascinator. Please read the description and view all photos before bidding. Please only bid if you intend to buy. From a pet and smoke free home. Please see my other items for sale. Thanks for looking and happy bidding. Stunning and unique style shoes. Very comfortable. Bag also available in separate listing. Front of shoe features diamante design on net. Pair of ladies black satin high heel stiletto open toe shoes. Shoes have a 3" heel open side and peep toe. Made in a satin look fabric with a fur and diamante detailing at the front. Beautiful shoes by Coast. Minimal wear just a couple of small marks on heel but not really noticeable unless looking for them, (see pictures) otherwise in great condition. womens shoes size 5 new Quiz gorgeous black satin and diamonte heels. Dusky Pink Satin & Black platform shoes size 6 - prom shoes!